The marine AIS (Automatic Identification System) is an automatic tracking technology used by ships to send and receive position reports. Vessels send positions derived by GPS to inform others and optionally receive positions from other vessels for local display. The system uses a dedicated radio on VHF marine channels 87 and 88 to transmit bursts of position data. Any ship may carry AIS and all ships over 300 tons are required to carry AIS. An AIS overview is available on Wikipedia. AIS receivers are now so affordable that land stations are being set up around the world to receive marine position signals and feed them to web sites that aggregate AIS data and present it in a convenient format often using Google maps. The largest such publically accessible site is Marine Traffic. They boast more than 1900 established and named individual contributors with an unknown number of anonymous contributors. 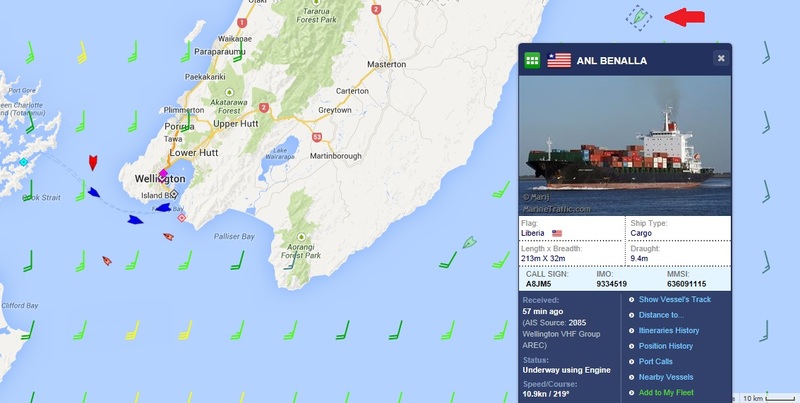 In this screen capture the vessel ANL Benalla (arrowed) heading south west at 11 knots off the east coast of the lower North Island. Apart from the other vessels shown, wind feathers can be optionally displayed for an appreciation of conditions at sea. Maritime New Zealand’s national search and rescue centre, the Rescue Coordination Centre New Zealand (RCCNZ), uses a network of AIS receiving stations providing seamless coastal coverage maintained by service provider Kordia. Free services like Marine Traffic provides a useful tool with more limited coverage for volunteer SAR organizations. Wellington is a harbour capital. Even if you never venture on the water it is impossible to escape the impact of the local marine geography on capital life. With the development of the Rangituhi – Colonial Knob site and a donation of an Icom MXA-5000 two channel AIS receiver the Wellington VHF Group AREC section has an opportunity to fill in some key gaps in the publically available AIS coverage around Wellington. The system at the site consists of the Icom receiver arranged to send position reports over the Internet for delivery to the Marine Traffic servers. Just 48 hours after installation the station has distinguished itself by covering more than 5,200 square kilometres, 180 km range, with reception of some 49 vessels, and received 8,800 messages.